Please note that Identity Truth has been discontinued and is no longer available. 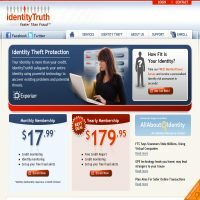 You can read our old review of Identity Truth below, or check out the rest of the Identity Theft Protection Services we've reviewed. Identity Truth is a comprehensive service, based in the US and available only to US users, that employs some of the best technology to get a complete picture of your individual identity fraud risk. Identity Truth describes the service it offers as being 'faster than fraud', allowing users to be warned far in advance of any potential risk to their identity and financial security. At almost $18 a month, per adult covered by the policy, it is certainly not the best value for money. Without a free trial, we would advise all users to be completely sure that Identity Truth is the site for them, because users are permitted to cancel their subscription only after the three month minimum term has expired (thus costing the user almost $60). That said, Identity Truth does give its users a wide range of protective features in order to ensure that their identity and financial information are totally secure. Firstly, users construct an individual 'Identity Profile' with Identity Truth, depositing with them a full list of all sensitive information that is to be protected. Users of Identity Truth can be confident of the security measures undertaken by Identity Truth in order to protect the information that is deposited with them - computer systems are regularly examined and tested by McAfee internet security, and all staff that work for Identity Truth are subject to rigorous background checks to ensure that they are suitable to work with sensitive user information. Once a user has constructed their 'Identity Profile', users can check out their dynamic ID health score, which gives an indication of the users level of risk of becoming a victim of identity theft. Identity Truth can then assess what measures need to be undertaken in order to ensure that any potential breaches in security are dealt with. Users can apply fraud alerts on all of their credit accounts to ensure that any new applications or large transactions will need prior agreement by the user using a 'safe phone number'. Identity Truth also engages in daily monitoring of Internet sites to ensure that the data that is protected by Identity Truth is not traded or sold online on one of the numerous sites that operate as a virtual 'black market' for ID thieves. All of these techniques collectively ensure that users get advance notice of any potential fraud that could have a negative impact on your credit rating, financial security or simply tarnish your good name. Finally, users can opt out of junk mail registers and the pre-approved credit records, so that not only are users freed from having to endure endless annoying offers of credit cards (and other financial products), but another avenue for credit fraud is closed down (as ID thieves often use fake credit offers to obtain identifying details). All of these services, combined with excellent customer service through a toll-free helpline and online FAQs combine to make an excellent service to the Identity Truth client. Even though the service is good, what Identity Truth offers is not necessarily original, and users could find less expensive but substantially similar services offered by other companies, ranked higher in our top 10 identity theft protection reviews. Therefore, we would advise users to shop around before committing to Identity Truth. Please note that Identity Truth has now been discontinued.